Globalization and hyper-connectivity have made outsourcing most tasks quite easy, especially in the early phase of your start-up. While outsourcing serves as a useful tool to juggle limited resources, it doesn’t provide a solution to every resource shortage you may face. If you are contemplating on outsourcing specific segments of your business, listed here are some pointers indicating when NOT to outsource. These pointers will help you to optimize and streamline your business operations. Information that keeps your business functional is its life-blood. If you have employee medical records, payroll or any confidential company information that needs to be transmitted to the outsourcing enterprise, there’s a risk of compromise in confidentiality. And when the outsourced function necessitates sharing proprietary company information such as, product drawings, product formulas, etc., this risk is even higher. In such situations, it’s prudent not to outsource. 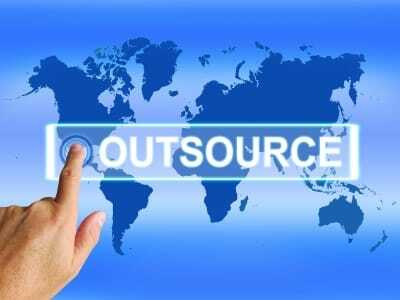 But if you still outsource, assess the credentials of the outsourcing enterprise carefully. Ensure that your data is safeguarded. Incorporate a penalty clause in the outsourcing contract to cover the costs of an untoward incident. Firstly, you must identify your company’s core business model. Knowing the critical aspects of your business helps you determine the segments you should not outsource. You derive competitive advantage from the superlative expertise, superior skill, and swift execution of your company’s mission. Hence, you must never delegate, transfer or compromise your “Core business competencies” by depending blindly on a third party. If your business is Internet-based, you should never outsource core programming functions. Although outsourcing a core function gives your company a short-term boost, you fail to develop the expertise in-house. You just cannot afford to outsource your core functions, especially if you desire to develop a sustainable competitive advantage. The enterprise to which you outsource your company’s core function may definitely not be as invested and attentive to your company’s success as you are. Remember, it’s impossible for you to build a great company by relying on another enterprise’s stuff. This is especially true when a company is developing custom web applications. We have found throughout the years it’s almost always better to hire an American programmer who can be in-house if you can find the talent. Cost-effectiveness is one of the fundamental advantages of outsourcing. Since health care, social security, and other forms of workers’ compensation are eliminated, outsourcing leads to a reduction in labor costs. Additionally, the increase in efficiency when tasks are delegated to industry specialists results in cost reduction. Even though several opportunities for cost reductions do exist, there are some instances when outsourcing proves to be more expensive. Hence, instead of leading to a financial gain, outsourcing results in financial loss. For instance, any project that’s outsourced to a highly specialized professional runs the risk of exceeding the budget for the project. The exorbitant fees demanded by professionals with highly specialized degrees makes outsourcing uneconomical. In this case, try to do it yourself or hire a college intern. Even when you outsource tasks or projects, your company continues to be accountable for the assigned work. This responsibility entails you to monitor the progress of tasks constantly. Essentially, your company continues to manage the outsourced project or task even after outsourcing it because you are solely responsible for this work and its successful completion. In such cases, outsourcing is not feasible when the individual or enterprise you outsource to is unwilling to give you access to files and documents related to the project. Since your company has vested interest in the project it has outsourced, it should have full information about the progress of the project. This will enable you to make decisions regarding the project. But when your company is denied access to files and documents related to the project, outsourcing becomes a bad idea because it results in loss of control over the project. Hence, before you outsource a task or project, you must establish the criteria for the complete management of work related to the project. You must schedule regular meetings in which you get updates on the progress. Also, establish a clear deadline for the completion of the project. Although outsourcing offers quick access to industry specialists, larger workforces, reduced labor costs, and increased flexibility, there are several situations when it’s not a good idea. Even though building in-house expertise is undoubtedly the tougher route to take, it’s worthwhile because it pays handsomely in the long run. You must retain your core company activities in-house if you can do so financially. Focus on leveraging outside assistance for everything else. This way you can outsource to ensure success. The core areas you must build in-house include: PR, customer service, marketing, sales, product design, and product development.